Because of their tremendous holding power and their quality of being easily removed and reused, screws are a common type of fastener. There are, however, other fasteners possessing great holding power. Some are almost impossible to remove once they are installed, but there may not be a requirement that they are removable. Sometimes the permanent nature of a fastener is its most appealing feature. Some alternatives to screws might prove useful. If you build a piece of furniture and do not wish to have exposed fasteners, dowels are an ideal solution. Furniture dowels are small wooden pegs that are inserted into matching flat-bottomed holes. Their diameter is usually slightly larger than the holes they are tapped into, and their holding power can be further augmented by adding wood glue. Fine furniture pieces, such as a walnut dining table, most likely have joints secured with dowels. For traditional post-and-beam construction, large, round wooden pegs are driven through the mortise-and-tenon joints. Made of maple or oak, they can last for centuries. Classic Amish barn construction is an example of the use of this type of joinery. Pegs also can used to fasten hardwood floor planking. Nails are an excellent alternative to screws. Ribbed or spiral nails have incredible holding power and never work their way loose. If you install porcelain insulators on a pasture post, double-headed nails can be substituted for screws. Unlike an ordinary nail, a double-headed nail is easily removed with a claw hammer or crowbar. If you install tongue-and-groove planking, finishing nails driven diagonally into the groove provide plenty of holding power while remaining concealed from view. In marine applications such as wooden boat building, copper or bronze nails are sometimes used instead of screws. 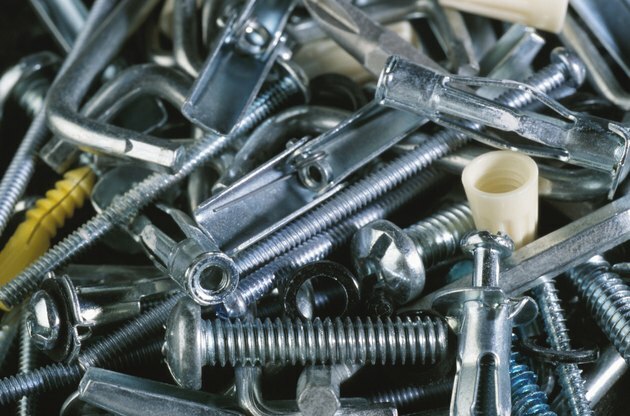 For metal-to-metal fastening, bolts are another common alternative to screws. Bolts can be inserted into threaded holes, or they may be secured in place using lock washers and nuts. Carriage bolts are frequently used in barn and deck construction. Like screws, they are removable and can be reused later if needed. If you build a very large wooden structure, such as a bridge, long sections of threaded rod may be preferable to screws. For joining thin metal sheets together, rivets can be an attractive alternative. Most aluminum boats, canoes and aircraft fuselages are held together in this manner. Every fastener has its strong points and weaknesses. Let the nature of your project and the materials you use determine your choice of fasteners.